Natalie M. Pence, age 91, passed away peacefully September 8, 2016 at her home at Waltonwoods Carriage Park Senior Living Community. Natalie was born July 12, 1925 in Detroit, MI, the daughter of the late Angelo and Maria Alfonsi. In 1951, Natalie married the love of her life Dale A. Pence and together they raised three children. Natalie loved taking pictures and oil painting. She learned sign language and taught the hearing impaired at her church in Detroit, SS Peter and Paul. She will also be known as a loving homemaker and outstanding maker of Italian food, entirely home made. Natalie is preceded in death by her husband Dale. She is the loving mother of Kathleen Stonik (Jerome), Kevin D. Pence (Pamela) and Karen Brudzinski (James). Beloved grandmother of Heather Murphy (Michael), Anthony Stonik (Corinne), Michael Stonik, Sheila Kelm (Aaron), Martin Brudzinski and Sara Brudzinski. Cherished great grandmother of Tyler, Kaitlyn, AJ, Alexa, Ashton, Devon, Dominic, Robert, Jarron, Ryan and Riley. Dearest sister of Ida C Morelli (Louis). Family will receive friends Sunday from 2-9 PM at the Neely-Turowski Funeral Home 45100 Warren Road (between Sheldon and Canton Center Rds) with a rosary at 7 PM. A Mass of Christian Burial will be held Monday, 10:30AM at Our Lady of Good Counsel Catholic Church, (Corner of N Territorial and Beck). In state 10 AM until mass begins. Interment Holy Sepulchre Cemetery. 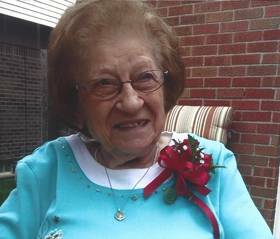 Her family suggests any donations can be made to the Alzheimers Association of Michigan. Feel free to use the above tabs to sign the online guestbook or to share a memory of Natalie.